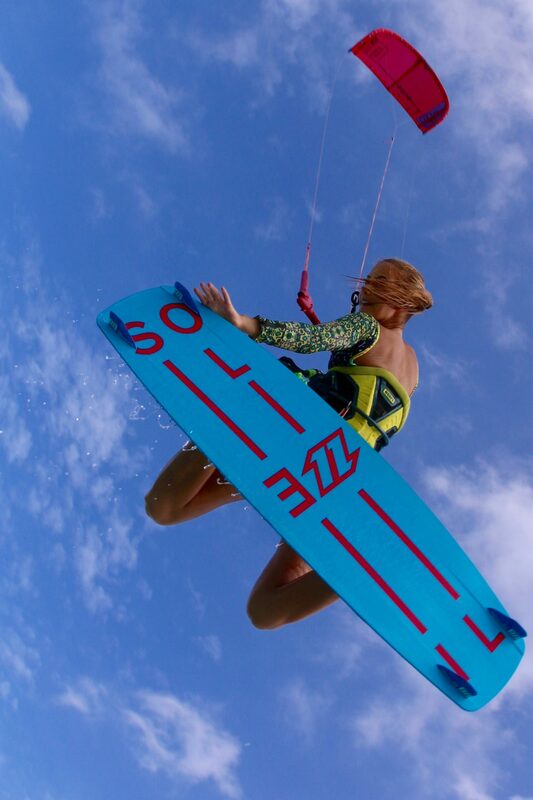 Home » Amanzi Articles » S.A.’s top Kite Surfer – Michelle Sky Hayward. South Africa’s Kite Surfing champion, a Maaji Swimwear model and travels extensively while blogging about ‘living the dream’. And she’s only 25. Amanzi had the pleasure of shooting the breeze with Michelle Sky Hayward about her journey, her secret health tips and her aspirations for the future. What have been some of your major successes and milestones in your career that led you to becoming a professional kitesurfer? What have you learnt from the kite surfing competitors that you can apply to your own life? Michelle: I have learned that just as the weather can be unpredictable, so can life. When you are at a competition, you are expected to compete regardless of the weather conditions. You sometimes need to adapt and perform in difficult conditions. In the same way, whether you like it or not, life is going to throw unexpected situations and difficult times your way. But you need to adapt and take it in your stride. So, the next time something unpleasant comes your way, you know how to perform and each time it gets easier. You are certainly living the dream. Travelling to exotic places, writing about it and modeling Maaji beachwear. Do you sometimes have to blink to check if it’s all still true? Michelle: Last year I was running a Pilates studio and teaching there full-time. I was only kite surfing over the weekends. I never got time to write and I was so unhappy! This year I decided to make a drastic change. I knew there was more out there for me, so I went out and got it. Now I am doing everything I love – kite surfing whenever I want, traveling around the world, writing, modeling the most beautiful Maaji swimwear and taking amazing photos. It was hard work to get here and it took a lot of faith and sacrifice. But it was all worth it because now I am living the dream! What’s it like being a swimwear model? Michelle: I don’t really think of myself as a swimwear model, but now that you mention it, I guess I am! I naturally pend a lot of time at the beach wearing only Maaji Swimwear. I don’t always feel like I am modelling, I just think of it as a natural extension of who I am. Do you follow a specific lifestyle and nutritional plan to stay in top form? Any secrets you can share? Michelle: I focus on eating very healthily. Lots of salads and vegetables and a bit of dairy, fruit, nuts and seeds. I also always drink a lot of water, especially when I am exercising. I never drink sugary drinks. Since I don’t eat eggs and don’t eat a lot of meat, I like to have a protein shake from Body By Wild, specifically after kite surfing or training at the gym. Although I eat healthily, I am not opposed to a cheat meal once a week, but of course, everything in moderation. But if I had to share a secret it would be to listen to your body. Not everyone is going to function the same on the same foods. Do what works for you and always keep improving on your nutrition. Also, don’t just exercise to look good. Exercise for the many other health benefits as well, like feeling happier, more focused, becoming more in tune with your body, and improving your heart health, self-confidence and longevity. And most importantly, enjoy what you do. Eat the kinds of healthy foods that you enjoy eating and do exercises that make you feel good. How do you come back from disappointments in your kite surfing career? Michelle: Honestly, it can be tough. Kite surfing has so many different aspects to it that makes it exciting, but can also be disappointing. There are so many factors like possible injuries, weather conditions, stronger competitors and days where you just don’t perform or improve like you want to. One thing that helps me a lot is knowing that I am not the only one feeling that way. I am not the only in the water experiencing those conditions and I am not the only one that must work through injuries and disappointments. I also sometimes get disappointed that I didn’t start kite surfing sooner in life and that I don’t always get the most favourable kite surfing conditions to improve on the certain tricks that I want to do. But then I trust that everything happens for a reason and I remind myself how blessed I am to be living the life that I am! Kite surfing is considered quite a dangerous sport. Have you had any near-death experiences? Michelle: Thankfully I have never broken a bone or gotten seriously injured. A lot of professional kitesurfers suffer from shoulder and knee pain, so I feel very blessed not to have any problems with that. All I’ve had is a few concussions and a sprain, stiff muscle or a scrape here or there. Kite surfing is an extreme sport and I have had a few scary moments from accidents far out at sea or in the waves. The important thing is to remain calm and always go over your safety measures before you get in into the water. And the times that I have felt like my life was threatened, I have always had other kite surfers around me to help me out and my wetsuit and harness help me to float. My husband also kitesurfs, and he always keeps a very watchful eye out for me. What is your favourite pastime when you are out of the water? Michelle: I enjoy different kinds of training at the gym like weight training, Pilates, spinning, suspension and fitness classes incorporating High Intensity Interval Training. I can’t always do the same thing at the gym, I get so bored! I also enjoy going out with my husband and enjoying all that Cape Town has to offer. Of course, I also love being at the beach, but whenever I am, I am also busy checking what the wind forecast is. Who should we be watching in the next generation of kitesurfers? Michelle: My mini-me! My little sister, Kayleigh, is only 12 years old and she is already flying through the water and the air. She is a lot younger, braver and more determined than I was when I first started. Michelle: Dream big, love fiercely, pray every day and spend time in the water because it refreshes the spirit. What’s next for SA’s kite surfing ninja? Michelle: I am really excited for the future. It has been a whirlwind of a year full of up and downs; but at the same time, I have achieved things in my career I could never have imagined. For now, I am getting ready for the Cape Town summer season to kick in where I will be kite surfing a lot, doing competitions and travelling locally. I am also focusing on giving back to the community and volunteering. I have been given so much in this life, but at the same time I feel like I have so much to give. In the future, I would love to do different kinds of international competitions, travel even more and do more TV and magazine interviews because I love sharing this incredible sport with the world. I don’t know what the next year is going to bring, but I am excited nevertheless!